But what happens to a breed of people hardwired by genes or culture or both to build, build, build when most of the building is done? What happens when the sprinting dog actually catches the car? That first moon landing--Apollo 11--was a very big deal, something we had pursued like nothing else. But Apollo 12? Sort of a letdown. It's not as if we don't have the financial means to keep ourselves stimulated. We spent $118 billion on travel abroad in 2012; we spend close to $25 billion per year to attend sporting events and, combined with Canada, nearly $11 billion on movie tickets. We buy ourselves an annual $140 billion worth of recreational equipment and $200 billion of electronics. But that's consumptive happiness, the happiness that comes not from sowing but from reaping, not from building the house but from watching TV in your new living room. That may be the goal of the work, but it's a goal that, once achieved, can leave us feeling bored. Since 1972, only about one-third of Americans have described themselves as "very happy," according to surveys funded by the National Science Foundation. Just since 2004, the share of Americans who identify themselves as optimists has plummeted from 79% to 50%, according to a new Time poll. Meanwhile, more than 20% of us will suffer from a mood disorder at some point in our lifetimes and more than 30% from an anxiety disorder. By the time we're 18 years old, 11% of us have been diagnosed with depression. The gap between our optimistic expectations and the reality that a significant portion of the population is, of late, cranky and dissatisfied may be what has spawned the vast happiness industry. We tap that industry in a lot of ways--with pills (the Time poll found that 25% of American women and 5% of men say they are taking antidepressants), with food (48% of women and 44% of men admit to eating to improve their mood, contributing to the U.S. obesity epidemic), with self-improvement products and services (including books, audiobooks and seminars, self-improvement is a $10 billion-a-year industry, about the same as Hollywood), with borrowed wisdom (there are 5,000 motivational speakers in the U.S., earning a collective $1 billion per year). 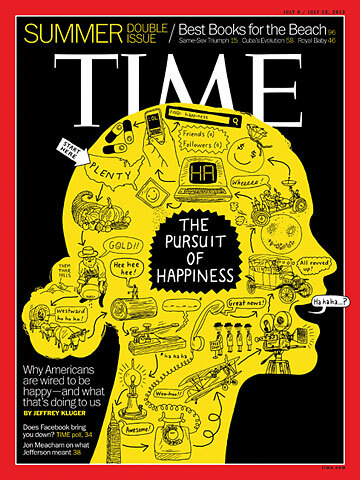 The pursuit of happiness, once an ideal, has become a big business but not an especially effective one; plenty of other countries are doing a lot better than we are without trying so hard. According to the 2012 World Happiness Report, published by the Earth Institute of Columbia University, the U.S. ranks 23rd on a 50-country happiness index, far behind No. 1 Iceland, No. 2 New Zealand and No. 3 Denmark and trailing Singapore, Malaysia, Tanzania and Vietnam.